Edelweiss Hut (top) was constructed October 6 & 7, 1934 and added onto for many years. This hut was torn down after Wilderness Act of 1964. Alpenglocke Hut was built June 1940 and named after an alpine flower similar to Edelweiss. This hut was torn down after Wilderness Act of 1964. Putting up sign in support of opening San Gorgonio to develop skiing. Highest peak in Southern California at 11,502 feet with north facing open slopes with plenty of snow. First recorded ascent on skis was February 3, 1931. San G was designated a primitive area which meant roadless or non-motorized vehicles only. First serious attempt to develop San Gorgonio as a winter sports area in April 1937 by Darryl F. Zanuck, Claudette Colbert, Paulette Goddard, Charlie Chaplin and William N. Neff. Most all these people were founding members of Southern Skis. Their proposal was rejected. Would build an all weather road from Barton Flats to South Fork Meadows. Lodge and public facilities could be built near meadows. Tows could run up surrounding ridges and part way up Big Draw and West Draw. Hearing was held July 8, 1942 at LA Biltmore Hotel. Due overwhelming opposing opinions, Forest Service decided to delay decision until after the war. December 1946, Forest Service reissued its proposal for developing San Gorgornio. June 18, 1947, conservations appreard to have won as no ski area was to be built. But there was hope for the skiers as 1,400 acres were to be excluded from the Primitive Area allowing for construction of a road to the top of Poop-out Hill. 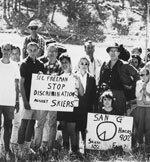 In 1960, Far West renewed efforts to remove 3,500 from the San Gorgonio Wild Area. 1962, San Gorgonio Ski Lifts, Inc. made a proposal to develop San Gorgonio. This proposal was headed by Morgan Adams Jr., John Reily, Andy Hauk, Howard More (Table Mountain), Herb Leffler (Mt. Baldy), Fred Sieling, Clem C. Glass, John Elvrum (Snow Valley) had the money to back their plan. Their plan was rejected. 1963, San Gorgonio Ski Lifts, Inc. submitted a new application to develop Dry Lake area and surrounding slopes. All of which are above 9,000 feet. 1964, Alex Deutsch had financial backing and proposed San Gorgonio as an Olympic training facility. July 30, 1964, the House approved the Wilderness Bill by an overwhelming 373 to one. The 3,500 acres were included in the San Gorgonio Wilderness Area. The fight continued on for many years, the result is that San Gorgonio will not be developed. Contemplating the run down the cornice on the highest ridge on San Gorgonio. Group of ski proponents at Dry Lake demonstrating in favor of developing ski facilities on San Gorgonio. Photo by Cecil Charles courtesy Aileen Spiller (www.skilibrary.com). Contents of this site Copyright © 1997-2019 by Pacific Rim Alliance. All rights reserved. Site designed & maintained by Graphic Dezignz. Last updated October 17, 2017.